Broken Saints - Chapter 11 - "Surfacing"
Surfacing: Depth Perceptions is a four-issue comic book miniseries from Approbation Comics. It tells the story of Marcus Wright, a young man who visits an oceanic research facility directed by his childhood friend, Anton Parker, who has a business deal to offer Marcus. The facility has captured a mermaid-like creature, and Marcus finds himself caught in the mystery of this creature and of its captivity. Surfacing: Depth Perceptions is written by B. Alex Thompson; drawn by Nenad Cviticanin; colored by Santtos; and lettered by Krugos. Surfacing: Depth Perceptions #2 opens with Marcus engaging in an extensive conversation with the mermaid, who eventually gets the name “Becca.” Anton warns Marcus that “it,” as he calls Becca, has the ability to “mess” with his mind and to manipulate people. To squash Marcus' admiration for the creature, Anton reveals some of the events that occurred before he arrived. THE LOWDOWN: The first issue of Surfacing: Depth Perceptions is one of the prettiest comic books Approbation Comics has published to date, and the second issue is equally pretty. The cover for both issues #1 and #2 feature gorgeous illustrations and shimmering colors by Cesar Grego and Alivon Ortiz. The interior art by Nenad Cviticanin gets better with each chapter, as his cleanly drawn line art reveals a confident storyteller. In fact, Cviticanin's graphical storytelling conveys the range of emotions writer B. Alex Thompson depicts in this issue. Among independent comic book creators, B. Alex Thompson is one of the best at writing naturalistic dialogue for genre comic books, including fantasy and horror tales. Writing naturalistic dialogue makes the characters seem like personalities rather than being props (in fantasy) or victims (in horror). The conversation between Marcus and Becca makes it seem as if they are two twenty-somethings on an apparently successful first date. I had to remind myself that they were actually a human and a creature of fantasy on a futuristic research facility. The second half of this issue does indeed offer genre intrigue and mystery. I have to say that I am surprised, although I should not be. B. Alex Thompson usually delivers high-quality genre storytelling, and he certainly delivers in Surfacing: Depth Perceptions #2. I READS YOU RECOMMENDS: If you like ocean-set science fiction thrillers (The Meg, Deep Blue Sea), you will want to read Surfacing Depth Perceptions. 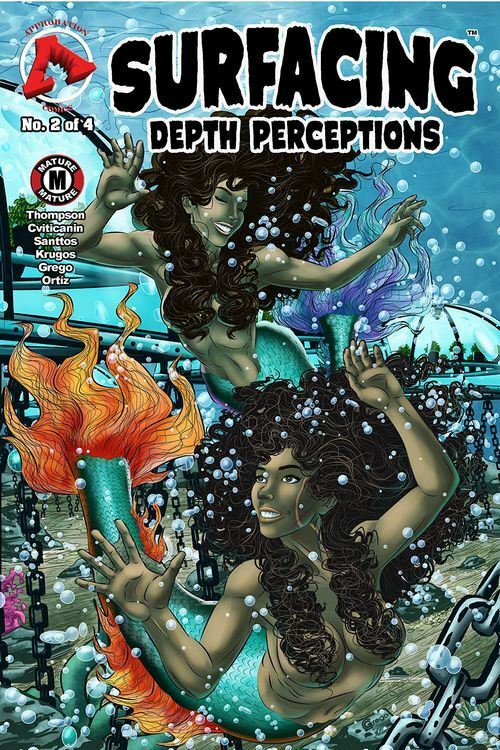 Buy Surfacing: Depth Perceptions #2 at comiXology.